Patek Henry Graves 1913 watchA custom-engraved Patek Philippe pocket-watch from the collection of American business titan Henry Graves Jr., or a superb collection of watches from award-winning “Without A Trace” actor Anthony LaPaglia are among the exciting watches coming up at the Christies December 14 sale of Important Watches in New York. The upcoming auction is the final sale, with more than 420 lots, is expected to break the $5 million mark with its investment-quality wristwatches, pocket watches and desk clocks by Patek Philippe, Breguet, Piaget, Rolex, A. Lange & Söhne, Audemars Piguet, Vacheron Constantin, Cartier, and more. True collectors can’t help but be drawn to the star lot: Patek Philippe177483, an engraved open-face pocket chronometer that once belonged to New York banker Henry Graves Jr. (estimate: $40,000-60,000). 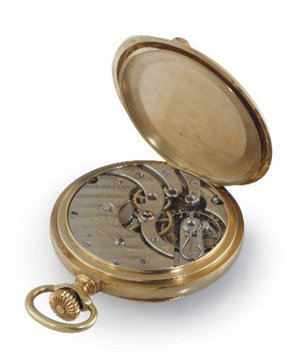 Graves was a collector of many complicated timepieces and is believed to have commissioned as many as 30 unique watches from Patek, including the storied technical marvel of 24 complications that took the brand’s most accomplished watchmakers more than five years to make. Other inviting lots come from the collection of actor Anthony LaPaglia of the TV drama, “Without A Trace,” among other top shows and broadway bests. His personal collection has amassed to more than 100 pieces and in the lots from Christies, one can find vintage and modern Roelx, Panerai, Patek, Jaeger-LeCoultre, Girard-Perregaux and Hublot, with estimates ranging from $2,000 up to $70,000.